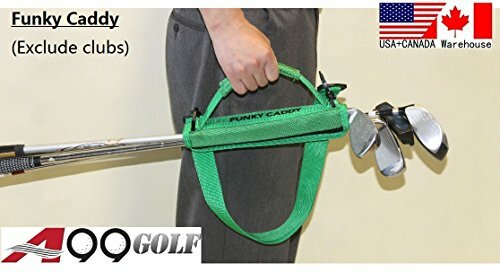 - The Extra Caddy golf club tote is a simple, yet ingenious invention to make toting 2-4 golf clubs as simple as it can be. - Perfect for a quick trip to the driving range. - A great way to tote a few clubs out to your ball on those "cart path only" days we all love so much. - Plus, it would be much less likely to leave a club behind if you use the Caddy. - Very well made from durable heavy knit nylon, top grade Velcro. - It is small and light and stores easily in any pocket of your golf bag. - It is an excellent gift idea!